“For me, I have always worked with children and I love it, I get to be silly and have fun and the delight on the child’s or parent’s face when they achieve their goals is just unbelievable,” says Ms Pates. “After finishing university, I worked at an elite sporting club and it was fantastic, but I never got this same feeling. Paediatric physiotherapists are trained physiotherapists who work with children from different walks of life, experiencing a wide range of conditions, injuries or developmental concerns. To be considered a Paediatric Physiotherapist, additional training and education is required via what’s known as Titling. Further specialisation will garner the title of Specialist. Titling can be obtained via an academic or experiential pathway, depending on the physiotherapist’s area of practice and number of years of experience. To be eligible for Titling via the academic pathway you must complete an Australian Masters degree by coursework and complete two years of relevant clinical experience. Those who haven’t completed an approved Masters degree, can still apply for Titling via the experiential pathway. To be eligible for this, you must gain five years full-time equivalent of relevant clinical experience with three years in the selected discipline. Paediatric physiotherapy is still a relatively new area of discipline, but figures show that over the past three years, more than 450 physiotherapists have completed the Paediatric Physiotherapy Level 1 course. In 2018, the Australian Physiotherapy Association paediatric group had 638 group members, 28 titled members and 2 specialist members. It’s an important area though, as babies, children and even teenagers all have growing bodies which are built different, move differently and think differently, with all these elements continuing to evolve as they grown. “Paediatric physiotherapists have expert knowledge and skills in the assessment, identification and diagnosis of, and treatment of issues that cause child development and movement difficulties,” says Ms Pates. 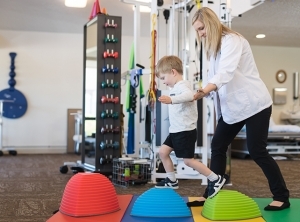 “So, by taking your child to a paediatric physio, you know you are seeing somebody that not only understands what is happening and why, but can explain it to your child at an age appropriate level and can also make rehab or therapy fun, creative and tailored to your child’s age, skills and goals. For parents of children with conditions needing physiotherapy from birth, such as cerebral palsy and cystic fibrosis, paediatric physiotherapists are a big part of life. However, Ms Pates says that outside of the hospital system and in the community, many parents don’t realise that there are paediatric physiotherapists that work specifically in the area of gross motor development, sports, injuries and pain. “The goal of a paediatric physiotherapist is to help your child achieve their goals. “A good paediatric physio probably won’t say ‘you’re weak here and tight there’, and instead will help your child see what they can do, what they want to do and help them bridge the gap. “Paediatric physiotherapists work across a range of areas including; neuromuscular disorders such as muscular dystrophy, neurological conditions such as cerebral palsy, injuries to the spinal cord, respiratory conditions such as cystic fibrosis, congenital issues such as spina bifida and developmental delay. A large area of paediatric physio includes orthopaedics; covering concerns such as in-toeing and out-toeing, bowed legs, flat feet, packaging issues from birth such as flat skulls, tight necks, tight hips, congenital hip dysplasia and injury including concussion and post-fracture or surgery rehabilitation. Some paediatric physio’s work in rheumatology; children can also have arthritis, connective tissue problems as well as chronic pain and fatigue. So when it comes to career development, the potential opportunities are far-reaching. “Paediatric physiotherapists can work in the city and the country, in hospitals and in the community, in private practice, in not-for-profit organisations and in the disability sectors. Along with the professional skills and qualifications gained via extended training, Ms Pate says there are a few key innate traits that help to make a fantastic paediatric physiotherapist. “The ability to laugh at oneself often, to be able to silly on occasion, to see strengths rather than weaknesses, to have an amazing imagination and think quick on your feet. “It is also really important to develop behaviour management strategies, especially if you are working with children with special needs or in group situations, that are helpful to the child. And there is a lot of research now to help guide us in this area.